Anat Cohen performs Friday, Feb. 12, in Emerson Concert Hall as part of Emory's annual Jazz Fest. Photo by Jimmy Katz. This February, join Arts at Emory for a diverse slate of campus events. The spring Cinematheque series "French New Wave: Classics and Rediscoveries" continues with curated films by French auteurs; Theater Emory showcases new plays in its series "Brave New Works," and the annual Emory Jazz Fest returns with two weekends of shows. Over the span of five Monday evenings, which began Feb. 1, the Michael C. Carlos Museum will host Virgil scholar and professor of classics Christine Perkell as she guides readers through the conflicting, complex interpretations of "The Aeneid" in Carlos Reads Book Club, which meets at 7:30 p.m. in the board room on level two of the museum. Jasper Gaunt, curator of Greek and Roman Art, will lead a five-week study into the art of the ancient Greek vase on Wednesdays in Greek Vase Painting Study. The seminar takes place at 7:30 p.m. in the Tate Room on the plaza level. Registration is required for these events. The Film and Media Studies department continues its Cinematheque series "French New Wave: Classics and Rediscoveries" this month with screenings of "Shoot the Piano Player" (1960), "The Soft Skin" (1964), "Breathless" (1960) and "Made in USA" (1966). Cinematheque screenings are free and open to the public; they are held each Wednesday at 7:30 p.m. in White Hall 208. On Feb. 20-21, the extreme narrative "Out 1" will be screened in two parts with breaks between episodes. Emory Dance continues the "Fast First Fridays" choreographic challenge under the helm of Greg Catellier with Atlanta dancer Claire Molla and five robotic lights. The performance begins at 6:45 p.m. on Feb. 5 in the Schwartz Center for Performing Arts Dance Studio. And on Monday, Feb. 8, the spring Friends of Dance lecture, titled "Argentine Tango for People with Parkinson's Disease: a Neuroscientific Perspective," focuses on the design and optimization of creative movement/dance-based therapies to improve mobility, cognition and quality of life in older individuals with movement disorders. The free lecture begins at 7:30 p.m. in the Oxford Road Building's presentation room. Theater Emory continues and concludes its annual "Brave New Works" series in the Schwartz Theater Lab with performances of new work, such as "The Bonobo Project," inspired by summer workshops in the lab; "King James;" the "Fellowship Series," in which three playwrights present material for consideration of the Emory Playwright Fellow position; and "The Looking Glass." Reservations are required and can be made online. Emory's annual Jazz Fest kicks off Feb. 6 at 8 p.m. with the Julian Bliss Septet's "A Tribute to Benny Goodman" as part of the 2015-2016 Candler Concert Series. 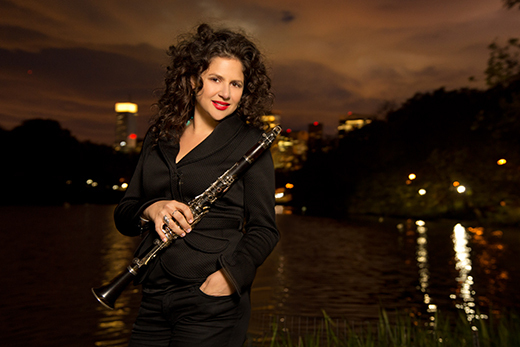 Jazz Fest continues the following weekend as clarinetist-saxophonist Anat Cohen teams up with the Gary Motley Trio in the Emerson Concert Hall on Friday, Feb. 12, at 8 p.m. Big Band Night closes out the festival with a free, public show Saturday, Feb. 13, at 8 p.m. All shows take place in Emerson Concert Hall in the Schwartz Center for Performing Arts; tickets to the Feb. 6 and Feb. 12 performances are on sale now. The Emory Chamber Music Society of Atlanta presents "Elena Cholakova & William Ransom: Two Piano Concert." Join the duo Feb. 21 at 4 p.m. in Emerson Concert Hall, as they perform Aaron Copland's "Hoe Down," Witold Lutoslawski's "Paganini Variations," Franz Liszt's "Reminiscences of Don Juan," and Maurice Ravel's "La Valse." Groundbreaking orchestral collective The Knights is joined by acclaimed violinist Gil Shaham as part of the Candler Concert Series on Friday, Feb. 20, at 8 p.m. in Emerson Concert Hall. Tickets are available online. On Wednesday, Feb. 24, at 4 p.m., Emory President James Wagner joins Rosemary Magee, director of the Stuart A. Rose Manuscript, Archives, and Rare Book Library, for a Creativity Conversation discussing Wagner's inspiration for his own creativity as well as how he has tapped into those energies for his work in organization leadership. The free event takes place in the Rose Library's teaching/learning studio on level 10 of Woodruff Library. The Emory Wind Ensemble, along with Theater Emory, presents "Music from the Stage and Screen" on Saturday, Feb. 27, at 8 p.m. in Emerson Concert Hall. This free concert features performances of Walton's score to "Henry V," Copland's iconic "The Red Pony," and more.